The Xamarin.Forms Chart control is optimized to visualize large quantities of data in an elegant way. Its rich feature set includes functionalities like data binding, legends, animations, data labels, annotation, technical indicators, and zooming. 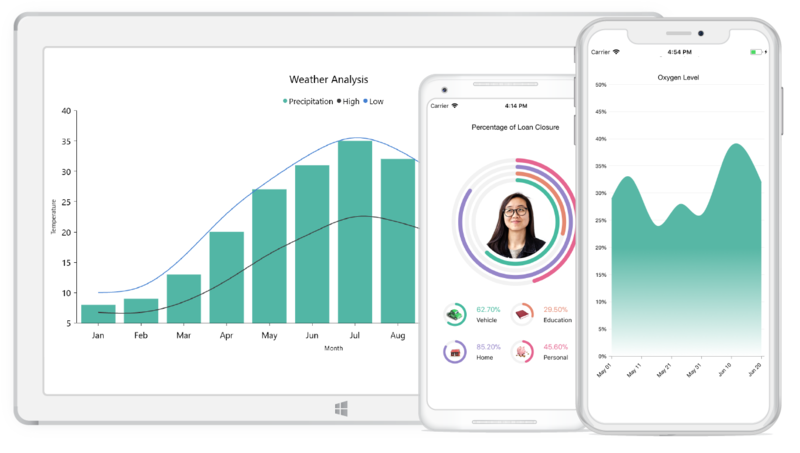 The Xamarin.Forms charts, a mobile friendly easy-to-use cross platform charting package, is used to add beautiful charts to mobile and desktop apps. It contains a rich gallery of 30+ charts and graphs, ranging from line to financial charts, that cater to all charting scenarios. Its high performing quality helps to render large amount of data quickly in your mobile and desktop devices. It also comes with a lot of features such as zooming, panning, tooltip, crosshair, trackball, drill-down, and events to make the charts more interactive. The charts include functionality for plotting more than 30 chart types. Each chart type is easily configured with built-in support for creating stunning visual effects. The Xamarin.Forms charts have been packed with interactive features such as zooming and scrolling, trackball, tooltip, drill-down, and selection. You can configure these interactive features using the developer-friendly APIs. Apply gradient colors to visualize data in different colors, improving the readability and appearance of a chart control. Elegantly handle the empty point values in Xamarin.Forms charts. The autoscrolling feature allows focusing on a minimal set of data points by visualizing only a few items in the UI and viewing the remaining data points by scrolling. Configure this feature in real-time updates to view recently added data points. Export the chart control as an image to a picture gallery or convert the charts to a memory stream.